Kiwi is a brand new entry in our list of designers here at UK Swimwear. Founded in 1985 in the South of France, they are naturally a stylish and delightful bunch of designs that are filled with colour, life and beauty. This little beach bag is the perfect accessory for your holiday. It is the ideal choice for a dose of practicality and for a stylish item that doesn't go out of fashion either. 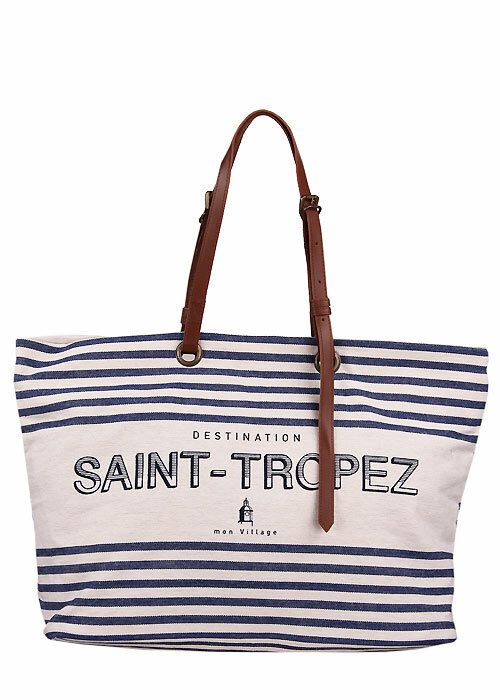 The nautical appearance with navy blue stripes and a canvas white background is always popular with beach goers. The bag has a secure zip closure, an inner zip pocket for valuables, and a leather carry strap. It's small enough to be easily portable but roomy enough to fit all the essentials for the beach, like sun cream, cash and a paperback.